The owner was very polite and helpful. The room was spacy, clean and comfortable! The bathroom was spacy and it had a bathtub! WiFi, TV and a/c were included. The room was cleaned regularly by the cleaning staff. The location is great. Near the centre of ialyssos and about 15 minutes to Rhodes by car. The price of the room is excellent. We had a great accommodation and we definitely recommend it to everyone!! The place has everything you need. A kitchen with a fridge and a stove, a good air conditioner, a nice Wi-Fi connection and a huge balcony. The interior is also very smartly done and looks very cozy. The location is very quiet but the main street with shops and tavernas is a short walk away. Mike, the owner, and his family are very nice people, it was a pleasure to communicate with them. It's our second stay at these apartments and we'll definitely choose Eugenia again for our next trip to Rhodes. Highly recommended! The property was very clean, the host was very polite and the room was a good Value for the their money. The property is also almost near to the sea. MIke is a great host!! I informed him in front that we will arrive after 21:00, because we would travel from Kos to Rhodos and he waited for us. The accommodation has no elevator and Mike brought our heavy luggage himself upstairs. We had a late check-out -and offered us to leave our luggage in another room which has not been rented yet. We could even stay there until the taxi pick up. Beach - shopping - eating facilities ALL within walking distance. The rooms were spotlessly clean. We had a fantastic vacation in Rhodes at this property! Michael (the host) is very nice. He made it possible to have check-in before check-in hours (since we arrived a bit earlier). Every time he saw us he was asking if everything was ok and if there was something he can help with. 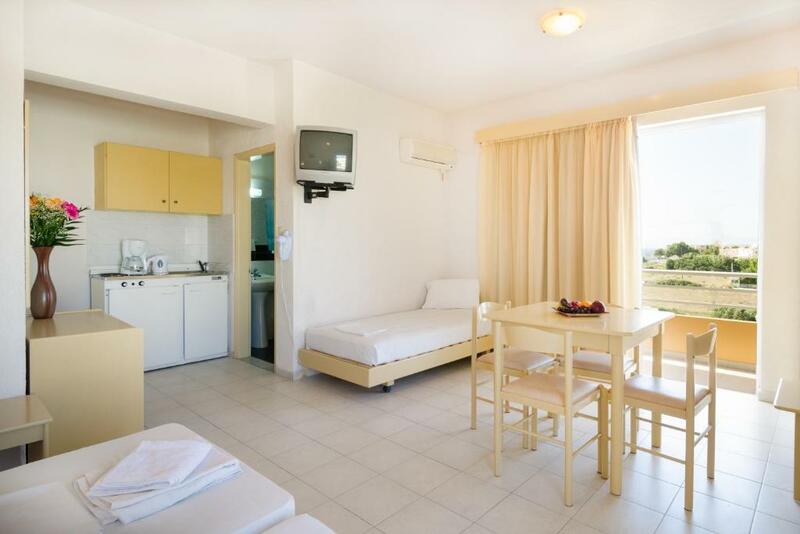 Location is very close to the beach (5 minutes) and also to restaurants, bars, car rentals but also to the airport (especially if you have to leave early in the morning when there is no public transportation and taxi is the only option). Room was generally clean, lighted and comfortable. The apartment was clean and it was cleaned every 2 days. Hosts were very nice and helpful. 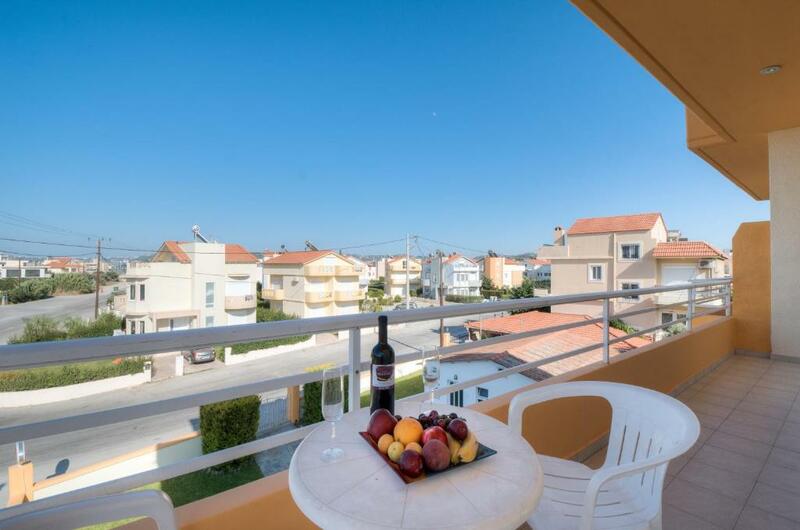 About 5min walking distance to the beach, also close to shops and cafes. Michael is a very kind and helpful host! He printed our tickets, and let us to leave our luggage at the house after check out...:) The apartement is located very close to the sea, and the city too. We absolutely recommend! The room is simple, but very good price and value! The host was really helpful and always there if we needed anything. The room was spacious and clean. We enjoyed our short stay there. It's located 3 min from beach and 5 min from main strip of bars and restaurants. The apartment was exactly as described online. When we arrived we were met by the owner who explained all to us and gave us the keys. I would highly recommend for anyone. Thanks again for a great stay. Lock in a great price for Eugenia Studios & Apartments – rated 8.7 by recent guests! One of our best sellers in Ialysos! Located in Ialyssos Village of Rhodes, Eugenia Studios & Apartments offers self-catering accommodations with free Wi-Fi access and balcony. 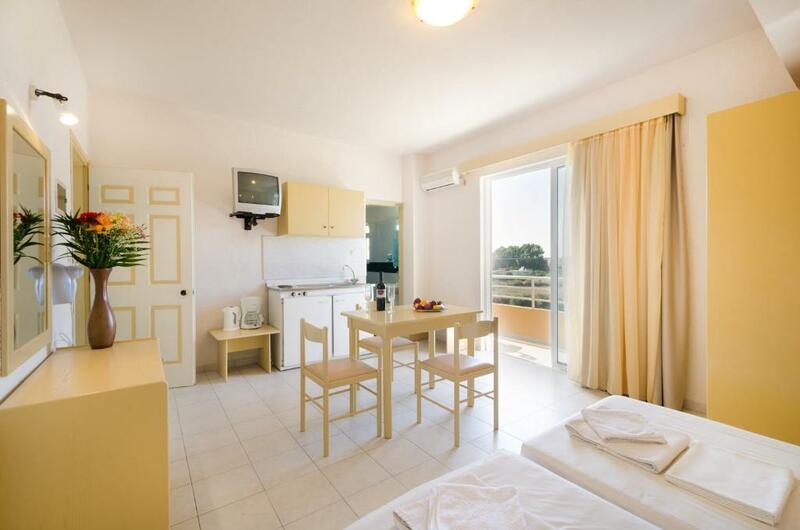 It lies within 350 feet from Ialyssos Beach and 500 feet from mini markets and restaurants. 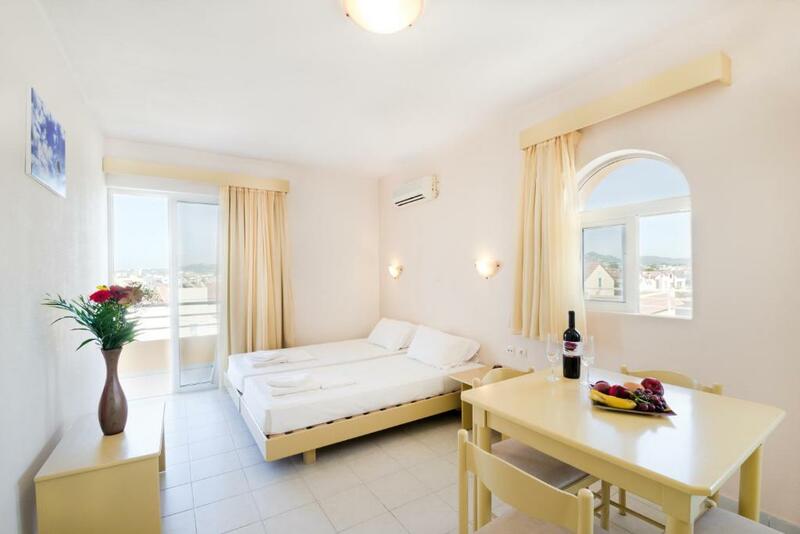 Fitted with tiled floors and soft colors, the air-conditioned studios and apartments of Eugenia enjoy views over the garden, the mountain or the Aegean Sea. 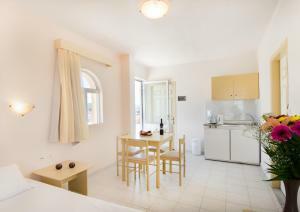 Each unit has a kitchenette with dining area, fridge and cooking hobs, and a bathroom with bath tub. A safe and a hairdryer are available. Rhodes with its medieval old town is located 3.7 mi from the property, while the lively Faliraki is at a distance of 8.7 mi. Rhodes Port is 5.6 mi away and Diagoras International Airport is 3.7 mi away. Free public parking is possible nearby. When would you like to stay at Eugenia Studios & Apartments? 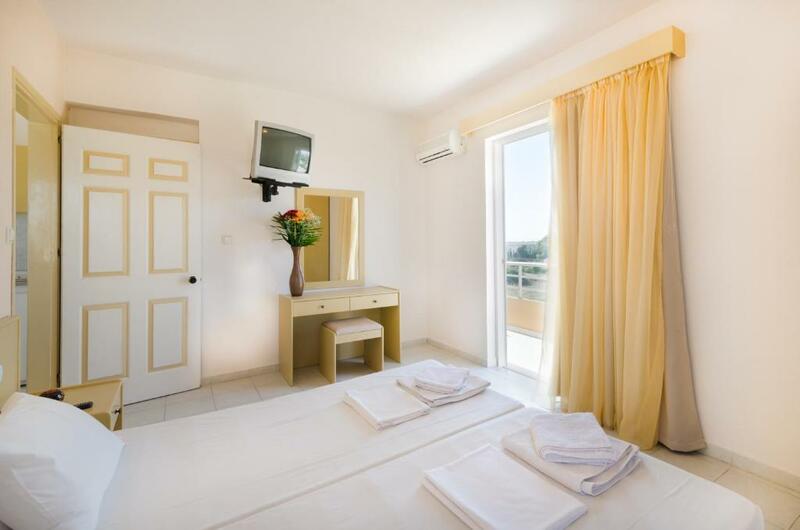 This air-conditioned studio comes with free Wi-Fi access and a balcony overlooking the garden and the mountain. It has a kitchenette with dining area, fridge and cooking hobs, and a bathroom with bath tub. A safe and a hairdryer are available. Featuring 2 bedrooms, this air-conditioned apartment comes with free Wi-Fi access and a balcony overlooking the Aegean Sea, the garden and the mountain. It has a kitchenette with dining area, fridge and cooking hobs, and a bathroom with bath tub. A safe and a hairdryer are available. House Rules Eugenia Studios & Apartments takes special requests – add in the next step! Eugenia Studios &amp; Apartments accepts these cards and reserves the right to temporarily hold an amount prior to arrival. Eugenia Studios & Apartments accepts these cards and reserves the right to temporarily hold an amount prior to arrival. Please note that children up to 2 years old can be accommodated in a baby cot free of charge. Please inform Eugenia Studios & Apartments of your expected arrival time in advance. You can use the Special Requests box when booking, or contact the property directly using the contact details in your confirmation. There are no shutters. Although the property had blackout curtains, there weren't so good having as result the light coming inside in the morning. Wish there had been a toaster. The fantastic view from our balcony (name it you could see it). Lovely, large, very comfortable bed. Near to amenities. Bus stop close by. Near to the beach(short walk). Near to the airport & so a regular stream of aeroplanes flying over, strangely enough it added to the experience. Great holiday & lovely hosts. Would stay there again. Wi-fi connection was relatively poor, there was a lack of TV channels in English (only euronews). The fridge has some noise. Kindly note the supermarkets are relatively expensive at least compared to The Netherlands. If you are staying for a longer period of time and have a car, maybe a one time grocery run to Lidl on the island for a family could be an option/alternative if you are on budget. Also to get some variety of foods. However it is not a show stopper at all. I really admired and very much appreciated the personal friendly care upon arrival. Michael was awaiting me and kindly received me to the apartment. We communicated very well and clearly in English. I enjoyed the spacious apartment and balcony. I was a female, solo traveler and immediately felt safe and comfortable. Everything functioned well in the apartment. The shower/bathroom seemed renovated. The kitchen is basic but suitable for basic meal preparation. Fridge, filter coffee machine, kettle, cups, plates, glasses, forks, knives, spoons, pots, pans etc. Essentials present for cooking. Its nice to prepare an easy meal and eat it on the balcony. The air conditioner worked properly too. Location is good. The nice sea is close by and the beach street has lots of shops and restaurants. The main road where you can catch the bus to Rhodes town (2.20 EUR) is also a very short distance away. It is well worth visiting Rhodes Town with its rich history. You also have a choice of nice excursions to be booked at agencies on the beach road. Lots to see and do on Rhodes. Restaurants are not over priced and food generally good. I found the people very friendly everywhere. I got a vegan cappuccino at a coffee shop. I was glad they are onto it too. I highly recommend staying here and I would return if I were to be in the area. The personal touch does the trick! Keep up the excellent job! I guess the only possible downside for some people is that the hot water is not very hot sometimes, but I have to say that it was always hot enough for me. No problem here. Room was spacious, clean and tidy, well situated in a strategic area of the town. Family run business, very friendly and polite people. well equipped, efficient wi-fi. Definitely enjoyed our stay there, will visit again. Double bed with one mattress.